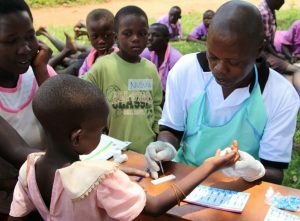 Children of Uganda (UK) recognised there was a need to supplement limited hospital services, by taking basic healthcare out into the community. Community healthcare will focus on preventative care to reduce the need for hospital treatment. On their last trip to Uganda, Trustees of Children of Uganda (UK) met with Kamuli Mission Hospital, doctors working in the local government hospital and with UK Rotarian doctors working in the Kamuli area. We are committed to providing a Community Centre to house this healthcare programme for our local community. The Community Centre will provide the infrastructure and expertise to focus on health and social issues in the community. In the meantime, Annette (BSUF Founder) and the team keep a close eye on the students and try to look after their health and welfare. 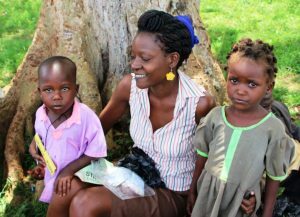 Recently she noticed that some of the children at the local nursery school appeared to be sick. The charity arranged for a visiting medical team to test and immunise the children for HIV-Aids, Malaria and other infectious diseases. Some of the children were found to be sick, with malaria, mumps and fungal infections! So the team could give immediate front-line help in the form of the right medicines. We need funds to organise more of these pop-up clinics across more schools in our local area – until the Community Centre is built with its permanent medical clinic facility. When the UK trustees were on their last trip to Uganda and visiting the schools, it was noticed that one of our children, Arafat, was not in class. The group then went to his home and discovered that Arafat was bedridden. They immediately took him to the nearest hospital, where he was diagnosed with a seriously degenerative hip problem requiring an operation. This involved taking Arafat to a hospital in Kampala. Children of Uganda (UK) paid for the operation and all Arafat’s medical and transport costs. Arafat has now recovered and is back in school. Ambrose is still involved, taking Arafat to regular medical check ups. More recently Annette was on hand when Blair, one of our younger students, was bitten by a snake. He was rushed to hospital, where it was then discovered he had a severe case of Malaria which also needed urgent treatment. We are delighted to report that Blair is now fully recovered and back at school. When we heard of the plight of a family having difficulties paying for the education of their four children, we took over the cost of the education for Owino, their third son. 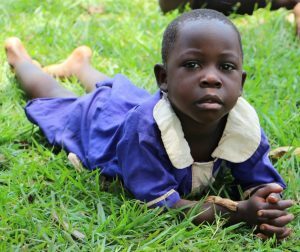 Both parents are profoundly deaf and so Owino, is at a special school for the deaf (and non-deaf) in the area. We are delighted to support this family. Annette and the team go on regular home visits to check on the welfare of their students and their families and to lend their support when needed. Here is Annette with Rose, one of our students who lives with her mother.